﻿ Cup Catcher | TECHXCEL JAPAN CO., LTD. The Cup Catcher keeping the cup from hitting the ground on the go! Innovative, must-have product for patents of infants and toddlers! The Cup Catcher is a multi-use connector to safely tether a Sippy cup, bottle or even your favorite toy to a car seat, highchair, stroller, wheelchair or shopping cart, all while providing a sanitary and stylish design!-The Cup Catcher passed strict FDA grade in USA. 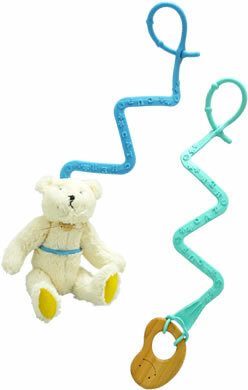 -Made of TPE which is safe to use for baby as it is BPA free & Latex free. -Internationally proves the high quality and innovative product by awarded from PTPA (Parent Tested Parent Approved) and Huggies Mom Inspired! All parents struggle to pick up their children’s stuff when going out. In 2013, a couple in USA started to research to solve this problem and they created first cup catcher one year later. After years of research and testing, they finalized their product with a patent pending design and unique safety features! Simply place the Cup Catcher ring under the cup lid. Secure the lid and be sure the bottle is well bound and no spillage. Roll the adjustable tail at strap or bar and put it to the hole of cup catcher. Inspect before each use, discard if any portion is worn or damaged. Do not use at nap or night time, never use in a crib, travel yard, or bed. Do not attach to child. In some cases there is a flaw in the curved part but it is not related to quality of product. Brilli Baby provides brilliant solutions for today`s family. and this is why the Cup Cather is proudly made in the USA from concept to finished product. Brilli baby will continue to add new product that provide brilliant solutions for today`s families.